Description Draw shapes and allow the rules of physics to do the rest. Controls Make clever use of physics to collect all flags in each level. The shapes that you draw are affected by gravity, friction and inertia. Use these properties in your advantage. The red ball (or red square in some levels), is the object that collects the flags. Draw the objects in such a way that they push the ball in the desired direction. Use the mouse to draw an object. You cannot draw inside other objects. Draw a circle by holding the left mouse button. 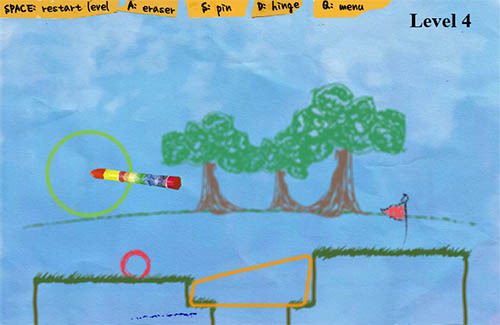 Feel the childhood by playing this drawing physics puzzle.